Think about your life, your current situation or your big decisions, honestly even the little decisions like going out of your way to talk to someone, be a friend to somebody or whatever it is. Think deeply for a second and look at why you haven’t done the things that God has told you to do, why you haven’t taken the little steps of faith and the big leaps of faith into what God has perfectly placed right in front of you. Now be honest about it, what’s holding you back from all the MORE that God has for you and that He’s divinely placed in front of you? The word I comes up a lot doesn’t it??? Yep. I say all that because it’s more evident now more than ever that the majority of steps of faith I don’t take in my life, whether with personal bad habits, sin strongholds, decisions, and opportunities to serve others in a way that may change their life. Whatever it is, little or big, “I”is always at the root of my regret, at the root of my doubt and failure, “I” is the biggest problem for all of us humans because that one letter word “I” holds so much power in our lives. “I” is the root of what’s holding us back from taking that next step of faith, to make that decision that we’ve been putting off, the decision that can change the course of the rest of our lives and most importantly as followers of Jesus Christ, “I” completely hinders and hurts how we follow Jesus in our lives. Of course the day I’m stuck in my “I’s” the worst, this verse came up as the verse of the day on the Bible app yesterday. Pretty cool how God works things together. Jesus says, to be his disciple, DENY YOURSELF. I’ve spent a lot of time getting caught up in the other parts of this verse because they sound really cool to do, “take up your cross and follow me.” But look what Jesus says first, before any talk about following Him. The first thing He says is to DENY SELF. Looking at it in the view of all the “I’s” in my life and the power they have to hold me back from ever moving forward following Jesus. It make sense why Jesus says this first, because following Him is near impossible when you are battling following your “I’s” and self. Denying oneself changes everything. Jesus knows that the moment we get our weak, doubting, prideful, sinful, and fearful selves out of the way, that’s the moment we change that “I” to “He.” When living out of what we got, what we think we’re capable of and how we see things, talk about some low living, regret filled, sad lives. When we realize that we don’t have to use “I” anymore because when we came to know Jesus as our Lord and Savior and that personal relationship with Him was established, we died to self just as Jesus died on the cross and Jesus raised us to new life as one with Him, no more “I” just Jesus. Jesus says “deny yourself.” Deny your I. In this new life with Jesus we don’t live playing the odds, counting the chance of success, or asking the question, “can I do this?” With Jesus we live off faith, we move off faith, we make decisions out of faith, we walk in the fullness of life and the MORE that God has prepared for us off of faith. Not faith in “I”, faith in “HE”, Jesus Christ. The coolest part of Jesus calling us to be disciples for Him and following Him is He gave us the biggest most powerful, life-changing, chain-breaking, risk-taking truth to embrace this life as a disciple. DENY YOURSELF. Jesus wants nothing more than for us to live in the fullness of the life He’s given us and point others to Him so they too can live life with Him. Jesus tells us “DENY SELF” because “I and self” is the biggest chains holding us back from walking in the freedom He’s given us. When our faith is not in ourselves but in who we are with Jesus, who He says we are, born again children of God, those chains are gone and we’re set free to just live, have fun waking up everyday and making the most of what God has for us, instead of getting torn up and worried because our “I” problem, we can just live, take risks, have peace that even if we make the wrong decision, even if we fail, that’s okay because Jesus doesn’t only give us life, He gives us an abundance of grace where He forgives us, picks us up, renews our mind and hearts back to Him and His ways, and moves us forward. Denying self changes everything about how we follow Jesus. If “I” is the root of why you are where you are today and why you feel stuck to move forward, don’t let it hold you back any longer. Give yourself, doubts and fears to Jesus and He will show you how to move step by step, as His disciple, following Him. The biggest lesson about denying self was my perspective on this situation and in a lot of my life, when we are so focused on our insecurities we miss out on seeing the goodness of God and how’s He is so perfectly putting you in the best situation to grow, live, and move into the MORE He has for us. It won’t always be easy but from my experience with this, don’t waste your days letting the incapability of yourself clutter your perspective and vision in what God has for you, the divinely orchestrated parts of His plan that knocks on your door saying “Hey you, child of God, lets roll out of this weak life and roll with me, leaning on my strength, my hope and my love moving into a life where impossible is not even a word, faith is the gasoline that fuels you, and where LIFE can be embraced with Jesus and lead into others receiving this same LIFE.” It’s crazy how everything changes when we deny our selves and live in the truth of who we are, children of God. The scariest part of this is how easy the “I” problem can sneak up on you and hold you back from what God has in store for you but we have His Word to remind us that life doesn’t have to be lived that way any longer. Prayer: ” Lord thank you for this truth and this powerful instruction you have given us. It’s truly amazing how everything is flipped upside down and changed when we get ourselves out of the way and come to beginning of you. Thank you for loving us to the point of giving up your Son as a sacrifice for us, thank you for giving us a way out of the life that we deserved to die on the cross and giving us new life with you! I ask Lord that you teach us how to step out of the comfort zone of our “I’s” and move into the MORE and fullness of life that you have for us. Teach us how to live off faith in you, and deny ourselves Lord so together as children of Yours, we can step out in faith, just live and enjoy this life, open our eyes to see your goodness and perfection being worked out in front of us and move our eyes from our own imperfection. Help us Lord be disciples of you and help us take up our cross so we can live humbly as tools for you to help others see you working through every area of our lives and help others see you so they too can experience the awesomeness and love in a life with you. Thank you Lord for today. Thank you for the gold found in your word and continue to renew our hearts and minds with your truth and help us apply these truths to our lives! Love you Lord! In your holy and precious name we pray, Amen. So I learned about these verses in class today and to be honest, I didn’t even realize there was a 3 John, I mean there are already so many other books with John’s name on it. Obviously I need to keep learning all I can. What’s so cool about this letter John writes to Gaius, which to be honest once again I would’ve never noticed by just skimming over these powerful verses like I would usually do. John is writing to Gaius who is a local church leader/pastor, encouraging him and thanking him for all of the faithful service he has dedicated his life to by serving the Lord and serving people with the Lord. This part stuck out to me because John is commending him for the hospitality he’s shown towards traveling ministers coming through his town. These guys are complete strangers to Gaius but he is still willing to do whatever it takes to help in advancing the Gospel and bringing the life changing truth of Jesus to people. It may seem like it wasn’t that big of a deal what Gaius was doing but that’s what’s cool about Gaius’ example of service. He didn’t have to open his doors and give a place to stay to these traveling pastors, in the context of these verses it says that Gaius is sick and struggling with some kind of illness that won’t seem to leave him. On top of that, he faced scrutiny from some members of his congregation about having these traveling pastors coming in and messing up what they had going on. Gaius probably didn’t feel like serving and being faithful in these moments but it’s obvious that the truth was the driving force of His life. The Gospel of Jesus Christ and the spread of that good news to people in need of Him, that was the most important part of his life. Everything else was secondary. I’m sure at times whether it seems like a little or big act of service, we so often make excuses, “I don’t have time for that, well if I serve in that way then it will mess up this or that.” At the end of the day, isn’t the good news of Jesus Christ coming to this earth, dying for the sins of man, and giving us a gift of eternal life when we deserved the death on the cross. I was extremely convicted today to think, what could possibly be more important than that??? Although I so often enter ME into the equation and what I want, I find myself wasting time focusing on me instead of focusing on the only truth that really matters on this earth. Whether it’s showing hospitality to someone through literally letting them stay at your house or showing faithful hospitality in little daily life ways with others, either way you put it, it’s important and no matter the size of the act of service, each moment we step aside from ME and live in God’s goodness and truth, the Gospel of Jesus Christ is spread and when God is in it fully without our selfishness, the little becomes huge Kingdom impact. It’s crazy to think about all the times I base my life and the opportunity I have to serve others off of ME and my wants, making excuses and listening to the opinions of the people around me, justifying my lack of faithful hospitality because it’s not what my neighbors doing or it’s looked down upon in our church culture or our culture we live in outside of church. Learning from Gaius example today, all the stuff we deem as important is nothing compared to the goodness, faithfulness, and love that God shows us daily and has shown us through the good news of Jesus Christ and what He has done for us. What’s holding us back from being faithful in our service in this mission to spread Christ to the broken lives all around us? When seeing the truth in the magnified way that Gaius sees it, seeing the truth in the magnified, extremely HUGE life changing way that it is, changes a lot about how we serve and how we seek out opportunities to serve and when God shows up at our front door with a chance to serve someone in our daily lives, instead of saying no because of this, that or the other, embrace each opportunity to serve in the truly important and BIG lens that it is. It may seem little at times but little is much when God is in it. Also, talk about some humbling hospitality, I’m out of town for a job interview and my buddy who lived not too far from where I’m checking out is letting me crash at his place for a couple nights while I’m here. It’s not anything special or out of the ordinary, it’s just what we do because Christ has called us to serve, the truth is too big to overlook when lives are at stake. My life and heart has been completely humbled and changed by my friends act of hospitality. So who’s life can be changed if we all embrace hospitality in faithful service of the good news of Jesus Christ! I’m excited to see the Kingdom impact that will be made through lives surrendered to the truth of the Gospel! It may be hard at times, we may not feel like it, we may be sick even, we may face so much opposition it doesn’t make sense, but with the view of eternity, it’s an eternal sacrifice for an eternal investment and God’s eternal glory will be magnified. Ran across my friend, Olivia’s post on Instagram today and I’m telling you, she was bringing the HEAT!!! It is such a powerful Word and one that changed my day completely around, reminding me that despite all the craziness and stuff going on in my life, the Lord has got me, He’s in full control, I need to step back and watch Him do what only He can do. In Olivia’s Words, NOTHING is too big for Him! Couldn’t help but share this awesome truth with you today and as much as it has impacted me, I pray you too can be lifted up by this powerful and awesome promise from God!! Super thankful for her sharing the Truth in this way and excited for you to see why this has got me so jacked up!! Hold on to your hats, Liv bout to preach!!! “Then Jesus told them, “You are going to have the light just a little while longer. Walk while you have the light, before darkness overtakes you. Whoever walks in the dark does not know where they are going. Hope everyone had a great Sunday and got some good Word to chew on this week! I heard an awesome teaching this morning and in part of this message, God was dicussed as the truth and the light. The pastor had a great illustration to paint an even better picture of how God as light, applies to our daily lives. After hearing this message, I haven’t been able to get this “light” out of my head. So put your sunglasses on because it’s about to get bright in the God Gold!!! Jesus spoke these truths to the disciples saying, “I am the light of the world. Whoever follows me will never walk in darkness, but will have the light of life.” Jesus is the light of the world. What could He possibly be talking about?? Well, think about this way, from man’s first sin in the garden of Eden, darkness has been a constant force in this world brought out by the devil and his schemes, temptations, and attacks on man with one goal in mind—> move man away from God. When sin and darkness was brought into the world, it has been multiplying and casting a shadow on man ever since and darkness can overtake anyone if we’re not careful. All it takes is one step into darkness, one moment of compromise, and that itty bitty little piece of darkness we allow in our life can spread and spread, like Jesus says, when the darkness overtakes someone, when one is walking and living in this darkness they have no idea where they are going, they have no idea of the darkness they keep playing with, it’s no big deal that it’s in their life or that it is overtaking every single area of their life, the relationships they have, everything. Darkness isn’t any joke, I’ve seen it affect my life in ways that still hurt me today, that still lead me to continue playing with darkness and leading me into other areas of darkness. Even though it’s not the same darkness that I had in my life at 22, darkness is still just as dark at 24 in what seems so small compared to the things of my past but darkness is darkness, it leads into every area of life, and when we are walking in it, we don’t even know, we are clueless to the trouble we bring to our self and how it so greatly affects the people around us. I’ve had my battles just like I’m sure you have, we will have this battle every day the rest of our life because this world we live in is filled with the darkness we try to stay away from. It’s hard. It’s real. But wait, there’s good news. So at my house we’ve got two dogs that stay in a fenced in area behind our house down a hill. It’s up to me and my brother Josh to feed them and take care of them, someday’s that task becomes more of a chore than others with as much as we run around and sometime procrastinate doing it. There have been times when I’ve had to feed them at night, yeah walk down the hill in the dark and feed them. I’m not going to lie to you, I’m not a big fan of walking in pitch black dark near the woods. It’s scary cause first off I can’t see anything and then the worst part, I don’t know what animals are out there waiting to get me, or what if there is a person down there waiting to come after me, or even worse what if there is a monster down there? You see how my mind starts assuming the worst and just because I can’t see where I’m going or my surroundings, I immediately become hopeless, afraid and believing the worst. No there’s probably nothing down there that can get me but the darkness will pull out some wild thoughts. This past Christmas, thank the Lord for my fiance’s parent’s! My future in-laws, gave me a Christmas present and among some different items was a spotlight, it was small like a flashlight but man, this thing has some power. I tried it out the first night when I got home late and had to go down the hill to feed the dogs. I could see EVERYTHING! I was still on the lookout for monsters, but because of this light, I could see them coming so I wasn’t afraid anymore. The darkness was still there but I had this spotlight so I could see where I was going, what steps I needed to take so I wouldn’t fall down the hill, because that may or may not have happened before. That trip down the hill with the spotlight, I was a completely different person and I had a whole new mentality and confidence. The darkness, the wild animals, monsters or whatever could come my way and it wasn’t going to hurt me because I had my spotlight lighting my path and giving me a sense of security in my situation. Big shoutout to the Mr. Steve and Mrs. Ginny on the most practical and awesome gift!!! Shout-out to God also for sending an even better gift for me and you. Although we struggle daily to stay away from the darkness in our own lives and in the world around us, God sent His Son, Jesus Christ, to be the light of the world and save us from this terrible darkness! Jesus gives a way out from walking around in the darkness, scared, hopeless, and with no clue where we’re going. Having a relationship with Jesus Christ reverses all of that because He is the Light of the World. Jesus keeps us from the darkness and leads us in His light, even with the darkness and temptation being all around us, Jesus is like that spotlight, lighting up our path, showing us where to go and where we need to stay away from, He keeps our feet from slipping, He keeps us walking strong, confident, and filled with hope. Jesus gives us security, knowing whatever comes our way He will shine His light on it showing us the incoming attack exposing the darkness for what it truly is, with Jesus as our light the darkness is consumed, He shows us that with Him we can handle any darkness that comes our way. In this security Jesus gives us, we have peace and joy like never before because we know that nothing can harm a child of light. Jesus is the light that shines on our heart, exposing each piece of darkness we harbor and shows us the way to move forward, past the darkness in addictions, strongholds or whatever it is, He lights up the way to move with Him, away from the darkness of our past and into the light of eternity, He consumes the darkness and gives us life in the light, life in the fullest of forms. Staying close to Jesus is a huge game changer in our personal struggles with darkness and the darkness we are surrounded by daily. Instead of walking blindly through this life not knowing where we are going, stay close to Jesus, put all your belief and trust in the light of the world and His light keeps your vision sharp, His light keeps you from stumbling and monsters, His light let’s you see what’s coming so you can keep moving away from the darkness if yesterday and into the life of light, purpose, power, joy, freedom, victory, peace and hope He’s given you!!! Dig in today and ask the Lord to light up your life! It’s crazy how different your steps become when you can actually see where you are going!Best part is when the Light of the World is shining through your life, Jesus Christ, others who may be in darkness, trapped, see the great way out shining into their life! A pastor concluded that his church was getting into serious financial troubles. While checking the church storeroom, he discovered several cartons of new Bibles that had never been opened and distributed. So at his Sunday sermon, he asked for three volunteers from the congregation who would be willing to sell the bibles door-to-door for $10 each to raise the desperately needed money for the church. Jack, Paul and Louie all raised their hands to volunteer for the task. The minister knew that Jack and Paul earned their living as salesmen and were likely capable of selling some bibles. But he had serious doubts about Louie who was a local farmer, who had always kept to himself because he was embarrassed by his speech impediment. Poor Louis stuttered badly. But, not wanting to discourage Louis, the minister decided to let him try anyway. He sent the three of them away with the back seat of their cars stacked with bibles. 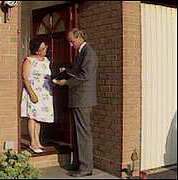 He asked them to meet with him and report the results of their door-to-door selling efforts the following Sunday. Louie just nodded. “That’s impossible!” both Jack and Paul said in unison. “We are professional salesmen, yet you claim to have sold 10 times as many bibles as we could.””Yes, this does seem unlikely,” the minister agreed.